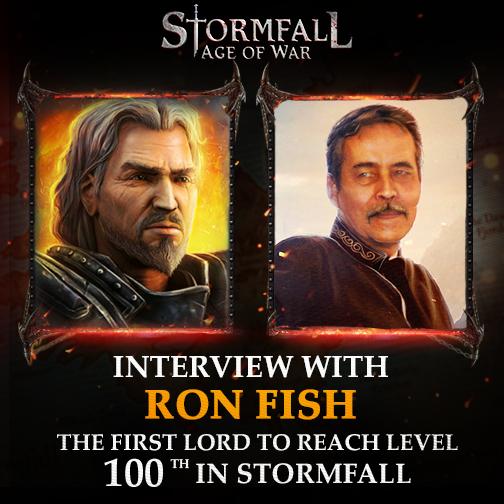 We discussed his victories and his trials, and gained some insight into what it takes to come so far in Stormfall. 1. Tell me about yourself. What noble qualities do you possess that helped shape you into the noble Lord you are today? Ah, nobility. Well, I refrain from picking my nose, at least in public. I do my best to treat other people and animals with kindness – ultimately, that is what nobility is. 2. How did you learn about Stormfall: Age of War? Did friends or relatives introduce you to the game? Or, perhaps, did a grey, grizzled owl come pecking at your window one night - its talons laden with silvery parchment, as though ‘twere sent by Destiny Itself to find you and you alone? Back in 2012, after 3 years of playing a different game where I held a key position in a top alliance, I decided that I needed something new - a game I could play without having to spend hours every day on politics and people management, and one that was a bit more relaxed (in the previous game, attacks could be mounted in seconds, and I could no longer bear being woken at 3:00 a.m. by alarm sirens!) I needed a game where I could rely on my teammates so I didn’t have to shoulder the burden of protecting the land by myself. I was fortunate to come across Stormfall, where teamwork is key. 3. How long ago did you first embark upon your Stormfall adventure? I believe that fateful day was over three years ago, now - April 2012. I played it for 4 or 5 months solo until I was recruited by Hawk and Simon. At the time, I think Search&Destroy was in the 7th spot. 4. Since then, you have crushed countless armies, leaving only dust and ash in the wake of your righteous conquest. Looking back upon all you have accomplished, what action, above all others, do you consider your shining moment - your single crowning achievement? First, I have single-handedly taken several Beacons – no small feat! Secondly, our League once took out a neighboring League in a single night. Lastly, there was once a night where we were under severe attack, and I helped assemble a coordinated response. We managed the threat beacon-by-beacon and emerged victorious. battle for supremacy, do you have any regrets? I do not. Perhaps, were I to start over again, I would not strive quite so quickly to get to BG 100. I also think I would focus more on attacking and defending in PvP combat, and less so on Battlegrounds. Experience Points from battling other Lords and Ladies seem to be less costly for my army; I sustain less Unit losses. 6. Your reputation as a Search & Destroy League warrior strikes fear into the hearts of lesser Lords. What gives your League their competitive edge? Our League benefits greatly from the division of labor with multiple partitioned duties, as well as strong squad leaders and consistent squad participation. 7. What part do you play in the League? What are your daily duties? My role is simple – the slaughter of Orcs and all those who dare cross us! Of course, full participation on the part of League Members is essential. However, it is equally important to create various leadership roles and fill them with dedicated individuals who are willing to devote sufficient time and effort to keeping the league running smoothly. It is critical to have strong squad leaders, as we do. 8. Have you met any of your fellow League members in real life? If so, please shed some light on the event. Were they anything like you expected? Unfortunately, I have not had the pleasure. Alas, such a meeting would be virtually impossible given my remote location. 9. Everyone who’s anyone knows that you own Stormfall’s Battlegrounds, consistently locking in the top spot in overall rankings. How many level 100 Battlegrounds have you done so far? Is the number too high to count, or can you hazard a guess? I have not kept close count, but I would guess at least 50. 10. A most glorious feat! Battleground raids are one of the most intriguing challenges in the game. Spoils of War – the victor’s prizes – are much sought after, yet great skill is required to obtain them. What Battleground tactics can you share? the Battleground is heavy in Marennon, I do not send any Beasts in the attack; similarly, if it is full of Ogres, I send no Occult Units. The same is true, but less so, for Defensive Battlegrounds, where Griffins have high defense against Marennon and Demons do well against Ogres. A wise Lord always keeps in mind the strengths and weaknesses of their warriors. 11. Your triumphs are myriad, Lord Fish! Even while leading Battlegrounds, you have managed a top 10 spot in the Offensive rankings! How are you able to defeat so many enemies without sustaining heavy losses? As I said earlier, PvP battling is many times less costly in Units, as long as you have enough of them to wipe the enemy out. I recently lost 6,000 Necromancers in a PVP battle – and for that battle, I received 160 Experience Points. Had I sustained similar losses at a Battleground, I would not have received so much Experience as recompense! 12. Do you have any advice for those who are still on the road to level 100? Boldly take on every quest and challenge you offered to you. It is easy to earn 100,000 risk-free experience points in a month! Personally, I always ensure that I have at one of every Legendary Unit. The last one will always be found at the Infirmary should it be lost in battle, as 70% of each Unit make their way there. Paying for the revival of those special warriors is Sapphires well spent, given the amount of extra attack/defense points they contribute, and the discounts at the Infirmary. I would advise new players to focus on getting their Town Halls, Warehouses, Farms and Mines up to Level 20 as quickly as possible. This rapid Resource growth will enable you to build and support the armies you need to progress in the game. Do not be ashamed to hide your forces in the Catacombs should you be unsure of the strength of an attacking force – I have done so many times. In many cases, it is not cowardice, but wisdom. And of course, ALWAYS keep your offensive Units protected in the Catacombs. If you have Sapphires available to you, they are perhaps best spent on Paragon Activation, due to the myriad benefits it brings – they simply cannot be ignored. Advance to Paragon Level 8 as quickly as possible, as it grants auto-completion of Individual and League Daily Quests. These are worth 4,000 points a day! 13. What do you do outside Darkshine? Do you have any words of wisdom for us? In real life, I am an engineering advisor with a major oil firm. I am on foreign assignment in Russia on Sakhalin Island just north of Japan. Being here without my family affords me the time to play this game 20+ hours a week. As for words of wisdom… Hah, I wish my children asked that of me! Remember, Lords and Ladies, that this is a game. Have fun with it, but do not forget to treat your friends and foes alike - with respect.